Getting around in Thailand is extremely easy thanks to the excellent tourism infrastructure and high volume of travelers. But not all transportation options in Thailand are equal; some involve a little more expense and hassle to get you where you're going. Save time and money on your trip by choosing wisely! Riding in a tuk-tuk at least once is a unique experience not to be missed while traveling in Thailand. In Chiang Mai and other places where taxis are rare, tuk-tuk may be your primary transportation option. Listening to your fast-talking driver try to up-sell you, meanwhile, sucking in exhaust fumes are all part of the "fun." If you're really lucky, your Redbull-crazed driver will treat you to a few high-speed misses. Tuk-tuks don't have seatbelts for passengers, but you do get a metallic dollar sign to stare at. 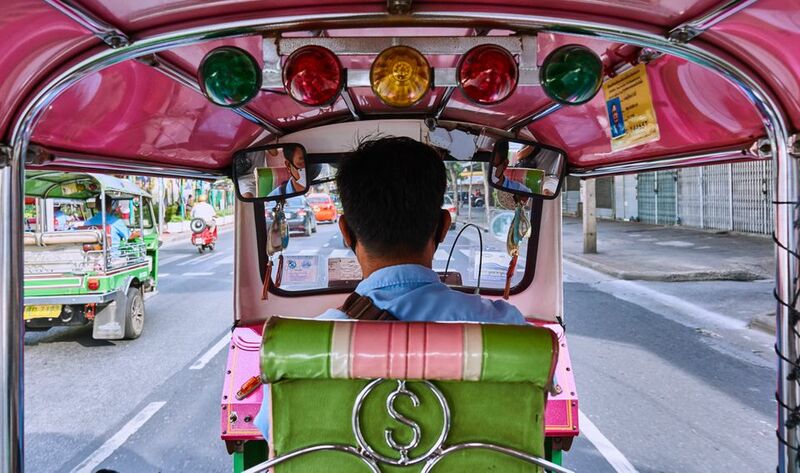 That said, know that even though tuk-tuk means "cheap cheap" in Thai, they often cost more than safer, air-conditioned taxis — particularly for foreign travelers. Because tuk-tuks don't have meters, you'll have to negotiate your fare before getting inside, otherwise, expect to pay way more than you should. Tuk-tuk drivers in Thailand are famous for their scams. Never agree to stop at shops the driver recommends along the way — this is a classic scam in Thailand. Songthaews are covered pickup trucks with bench seats in the back, and they're as ubiquitous in Thailand as tuk-tuks. You'll generally encounter two kinds of songthaews: ones that ply fixed routes around a locale and ones you hire as you would a tuk-tuk. In the case of the latter, you'll need to confirm the fare before you get in. Common destinations (the airport, bus terminal, etc) likely have fixed rates; you won't be able to haggle. You may be able to negotiate fares for other destinations (e.g., your hotel), but the driver is allowed to pick up other passengers along the way. By default, Songthaews are one of the slower transportation options in Thailand. The red songthaews seen circling places such as Chiang Mai and many of the islands often follow a set route. Fares are fixed and very inexpensive. Locals just seem to know the system, but you won't find it on signs or advertised. You'll have to confirm with the driver where they're going before you get in. Don't delay them too long; much like Jeepneys in the Philippines, they're often crammed with locals who need to get somewhere! Taxis in Thailand are often cheaper and more comfortable than going by tuk-tuk, assuming you ensure that the driver uses the meter. Just because the sign on top says "Taxi Meter" does not guarantee that the driver will use the meter — many will adamantly refuse. Don't get caught by surprise; confirm the meter usage by speaking through the window before you get inside. Hail taxis that are on the move. The ones parked around tourist areas must pay into a hierarchy to sit there. Choose a driver who is wearing dress clothing. Drivers who wear shorts or T-shirts are most likely part of the local taxi "mafia." You can also judge the appearance of the vehicle. Older, banged up taxis should be avoided. You'll be expected to pay a surcharge for leaving the airport, and you will also be expected to pay any tolls encountered. Have cash ready or tell the driver you don't want to use the "expressway." Much to the dismay of the local taxi mafia, using ridesharing apps is still a good transportation option in Thailand. Overall, you'll pay a little more, however, you won't have to deal with a dirty driver showing you vouchers for local "massage" parlors or claiming the meter is broken. In 2018, Uber merged Thailand operations with Grab to, the leading rideshare service in Southeast Asia. Although a few nefarious proprietors may offer you a ride on their personal motorbikes, official motorcycle taxi drivers in Thailand must wear a colored vest. You'll need to negotiate your fare before getting on, then hold on tight — taking a motorcycle taxi in busy cities can be a hair-raising experience! Note: Motorcycle taxis are useful for getting around traffic in a hurry. Your driver will literally squeeze between cars and use sidewalks to save time. Keep in mind most travel insurance policies rarely, if ever, cover accidents that occur on motorcycles. Traveling by train in Thailand can be a very enjoyable experience, particularly on short, scenic jaunts such as the stretch between Bangkok and Ayutthaya. Unlike long-haul buses, trains often fill up quickly in Thailand; try to book your ticket several days in advance to get the class you want. Thailand has a mixed assortment of trains running the rails, so whether you end up with a new, modern carriage or a squeaky, aging one is simply a matter of luck. Regardless, trains are better than buses for both scenery and the freedom to stretch the legs. For overnight trips, travelers typically default to second-class sleeper cars. An attendant will come around to convert the facing bench seats into two bunks with privacy curtains. Top bunks are slightly cheaper but shorter in length; travelers with long legs will be cramped. The dining car at the back of overnight trains is an option, however, you can avoid overpriced train food by bringing your own snacks and fruit. When taking long-haul buses in Thailand, you basically have two options: tourist buses and government buses. Tourist buses depart from corners and lots in places such as Khao San Road in Bangkok, meanwhile, government buses use proper stations as their bases. Visitors to Thailand more often than not end up on tourist-only buses with tickets sold by travel agencies and reception desks. Going by bus is a cheap, popular way to get from Bangkok to Chiang Mai, however, trains and domestic flights are more comfortable options. Although volume sometimes makes tourist bus prices cheaper than the government buses, tourist buses are often unpleasant — passengers are herded like cattle — and sometimes even the targets of theft. Rather than get treated as a customer, you'll often end up treated as a nuisance. For a more comfortable, long-haul bus experience, you'll need to make your own way by taxi or tuk-tuk to the bus station and purchase your own tickets rather than going through an agent. Navigating the station and finding the right queue can sometimes be a challenge, however, government buses are often more comfortable; many segments include water and snacks served in route. Taking a night bus in Thailand has some advantages. You'll save a night of accommodation, wake up at your destination, and won't waste a nice day moving between points. But unless you're well practiced, don't expect to get much sleep on a night bus as your driver blows the horn and careens over rough roads! Legroom can be cramped, particularly if the passenger in front of you fully reclines their seat. Although a tiny squat toilet will usually be found on board night buses, you'll hopefully make one or two stops so that the driver can take a break. Stops at the sprawling roadside travel centers are typically very brief — you'll have just enough time to maybe use the toilet and grab a drink. Tip: Bring a fleece or blanket with you on the bus. Although a blanket is sometimes provided, they are of questionable cleanliness. You'll be glad you brought some warm clothing as the air conditioning often reaches freezing temperatures! If you choose to take the overnight tourist bus, do not leave any valuables in your luggage that will be stored beneath. A decades-old problem, the drivers' assistants climb into the luggage compartment of your bus while it is rolling down the road and riffle through bags. Small items such as pocketknives and phone chargers often go missing. Your bus and the thieves will long be down the road before you discover what's gone. Thieves don't always go for big items. Even expensive items such as sunscreen and razorblade replacements are stolen. Lock your luggage or use plastic zip ties to connect zippers; you can cut them off after you arrive. Pack only laundry — the dirtier the better — at the top of your bag to discourage snooping. Close your bags in a secretive way so that you can tell if they have been opened. Use your imagination. In the passenger area, don't place bags near the center aisle, and never fall asleep with a phone or MP3 player in your hand. Write down the bus company, license plate, and keep your ticket. You can file a claim, but the tourist police will be of very little help. The problem of theft on night buses is especially rife on the tourist buses from Khao San Road in Bangkok to the Thai islands and Chiang Mai. Although certainly not the cheapest transportation option, budget flights are always the safest and most comfortable way to move around Thailand. The earlier you book with budget carriers, the more money you'll save. Fares between Bangkok and Chiang Mai could make you spit out your coffee — in a good way. Rates for a one-way ticket can be as low as US $25, but you'll still have to pay extra for luggage, seat selection, etc. Even still, reducing a painful, overnight bus trip down to 1.5 hours is tempting in many ways. Bangkok's Suvarnabhumi Airport (BKK) does a good job at handling the high volume of travelers, however, you'll probably be flying out of the old airport, Don Mueang (DMT), when booking on budget airlines. Nor Air and AirAsia are two of the most popular budget choices for domestic flights in Thailand. Surat Thani (URT) — for access to islands in the Gulf of Thailand such as Koh Lanta. You can rent scooters throughout Thailand for between US $5 – $10 per day. If you're comfortable driving one, renting a motorbike can be a fun, inexpensive way to explore islands and visit sites outside of town. Unless you're an experienced driver in Asia, leave driving in the big cities for another trip. Remember: You drive on the left in Thailand! Sadly, per the World Health Organization, Thailand has one of the highest road fatality rates in the world. Drive safely and always wear the helmet.